The snow and ice that accumulate in the outdoor areas of your property can become a major hindrance to movement and it can be extremely frustrating to shovel all the snow from the driveway at night only to find that there is an even thicker layer of it the next morning, Snow removal can become extremely tedious and time-consuming and the one way to ensure that the snow doesn’t bring your life to a standstill is to hire the services of an experienced company like ours for snow maintenance. We take great pride in our work and in the fact that our company offers prompt, efficient, reliable and cost-effective snow removal solutions to our customers. Not only do we cater to residential customers, but have a team of highly trained and skilled personnel that can handle even the most complex snow plowing and clearing jobs on commercial and industrial properties. We are available 24/7 to attend to all your snow clearing needs and can tackle any emergencies that may arise as well. Snow Removal (Daily) - Many commercial and industrial property owners have in-house personnel that handle snow clearing on their properties. But there are times when the snowstorm is extremely severe and you need professionals to handle the job. We provide day removal services and will come over to your commercial or residential location and ensure the snow is cleared quickly and efficiently. Snow Removal (Monthly) - We also offer excellent monthly snow removal contracts and these prove to be very cost-effective for our commercial and industrial customers. Snow Removal (Seasonal) - The one way to be entirely worry-free this winter is to opt for our seasonal snow removal services. This ensures your property will be cleared of snow ever time there is heavy snowfall, without you having to call us for the service. 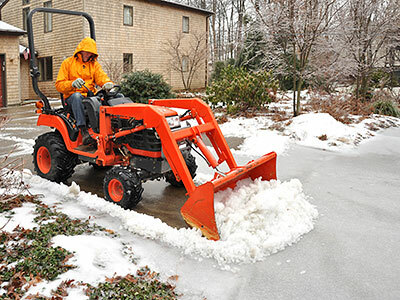 At AK Lawn Care, we handle every aspect of your snow removal job from start to finish. Call us at 734-439-3063 and speak with our experts about your requirement. You can also send us the specifics of your project via the Contact Us form on this page and we will revert shortly.